Are you looking for ideas to make your trade show booth interactive and fun? Let us help you show you how to use tablets, touch screens, trivia games and social media walls that drive booth traffic and capture leads. While interactive trade show games are a powerful addition to an exhibit, they are just one of many activations in an island booth. How do you plan and design your island trade show booth to get larger visitor counts all along the buying the cycle? There are lots of interactive trade show games. Which one is the best choice for your organization, booth size and show? This article below will help you pick the best interactive trade show game for your events. People love to see their name in lights. The leaderboard creates a large visual beacon that pulls visitors into your trade show booth from the aisles. Once a visitor sees their name on the leaderboard, they often take pictures to show their friends. What makes our games and contests really gather a crowd, and keep people engaged, is how well our games play on peoples’ very human emotions. There are 6 key emotions that we see over and over driving people to keep playing. A complete solution for attracting visitors to your booth, capturing leads, qualifying leads, fulfilling the leads and measuring the impact. When you manage a large trade show program with 20, 50, 70, even over 100 shows, your regional trade shows pose several unique and significant problems. How do you deal with field sales reps not forwarding leads? Or lack of badge scanners? or measure ROI? This article below will help. Fun, attractive games that draws in attendees who enter custom information to play for prizes! After the show you get easily exported leads & performance metrics. Is a Virtual Prize Wheel Better than A Regular Prize Wheel? There are lots of interactive trade show games. Which one is the best choice for your organization, booth size and show? The Guide below will help you pick the best interactive trade show game for your events. One of the biggest decisions for our clients who use our Virtual Prize Wheel game in their trade show booths is: What kinds of prizes should they give away? After seeing some clients struggle with this choice, here is some advice that will help you have a smoother experience. A version of the Virtual Prize Wheel game where, rather than spinning a virtual wheel to reveal a prize, it pops up on the screen. Do you guess how well your trade show or meeting performed? Analytics will show you how well your trade show games performed at your last event by giving you data on lead capture, booth traffic and game performance. In addition, you will be able to compare events to each other. Simple, fun game that pulls trade show attendees into your booth to play because it is great looking, fun, and offers the chance to win a prize and get on the leaderboard. Watch A SocialPoint Game In Action! Click on the video to see for yourself how our interactive trade show games look great, draw a crowd, are easy to play, and engage your booth visitors. 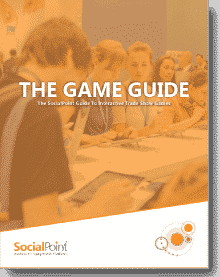 Learn how to get more booth traffic and engagement with your free 52-page e-book that shares proven methods for implementing trade show games!